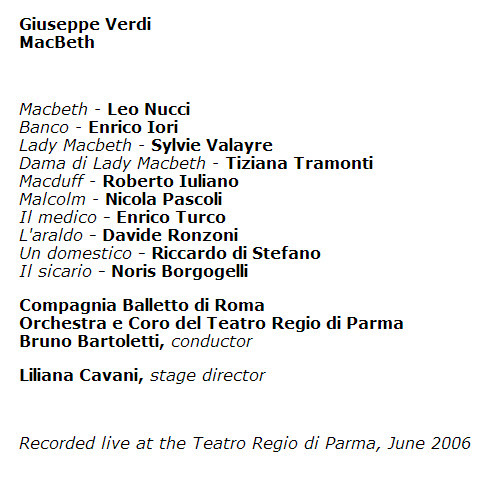 The Teatro Regio di Parma recorded Macbeth as part of its series of all of Verdi’s operas in October (rather than the June given below) of 2006. The video was taken from six different performances which makes one wonder if there was a lot of singing that was off on any given night. Macbeth is a masterpiece; but where to place it in Verdi’s canon is a problem. Its first version appeared in 1847 in Florence. He revised it in 1865 for Paris. So is it early or middle Verdi? It is both. The Sleep Walking scene is in the original. Of course, it’s so good that it couldn’t be improved. “La luce langue” was written for Paris. The colossal finale to act one (Act 1 finale) depicting the horrified reactions (both feigned and sincere) to the discovery of King Duncan’s murder was in the original; the sublime chorus of the Scottish exiles “Patria oppressa” is part of the revision. I think it best to avoid classification and take the opera for what it is – a great musical rendering of Shakespeare’s play. This is the first production in this series in which the staging is disappointing. Remember that I’m reviewing these operas in the order in which they were written rather than in the order they were staged by the Parma company. The problem with Liliana Cavani’s setting is that it’s full of unnecessary business. Part of the chorus sits in what resembles stage boxes and are dressed in costumes redolent of the 1940s. The intrusion is supposed to recall the Mussolini era, I suppose. This directorial overreach is distracting and takes away rather adding to the drama. Also distracting is the ballet in the third act. Verdi intended it to be an integral part of the scene; and he wrote some very good music for it. But he did not expect its choreography to be from the Ministry of Ugly Walks. Amadeo Amodio’s dances are closer to grotesque than grace. Macbeth would have been much better served had the Parma house stuck to its usual practice of minimal sets and luscious costumes. The witches, in another mistake, were dressed as and appeared to be washer women. They were also brightly lit compounding the error. OK, the production was flawed; good singing could have saved the day. And by and large it did. But if it took six days to cobble one presentable performance, the viewer of the video cannot be sure how good any one performance truly was. Macbeth depends almost entirely on art’s most dysfunctional couple. Macbeth was sung by veteran baritone Leo Nucci; he was 64 at the time of these stagings. He looks more like Macbeth’s grandfather than the murderous king; but he still sounds like the great Verdi baritone he was 20 years earlier. His sound is large and his high notes secure. His acting was as good as his age would allow. It’s hard for a senior citizen to portray a power mad young laird. He again indulged his vanity by breaking character to acknowledge the applause after Pieta, rispetto, amore . Macbeth, alone among Verdi’s operas, lacks a romantic tenor. Macduff does get a really good aria (Ah la paterna mano) in the last act. But aside from that he doesn’t have a lot to do. The song is so good that leading tenors are often persuaded to sing the part. That’s not the case here. Roberto Iuliano gives it a pedestrian reading. Bruno Bartoletti has been conducting Verdi for so long that every note is part of his permanent consciousness. He gets everything right and leads a passionate rendition by his orchestra and chorus. Musically this is a very good account of Verdi’s first treatment of Shakespeare. It’s the visual that adds little. Accordingly, this is a performance that should work better on a CD than on a DVD. “Ministry of Ugly Walks.”…not the Ministry of Silly Walks?? Love Valayre!! Saw her in Tosca and Nabucco. Middle and upper range effortless and drop dead gorgeous. Never a strained note. None of that rattley resonance so many dramatic and even lighter sopranos have. Hearing Tosca with fantastic sound and not having to brace myself for those screamy high notes.